At times, I am very glad that my parents are travel-fearing. This has actually led us to travel by road and I have been to many road trips in both North and South India. Why self driven road trips? Comfort and freedom of movement at own's convenience. Nevertheless, I turned out to be completely opposite to my parents. I love to go to places - by any mode of transport, but yes, the national and the state highways remain my favourite! This trip to Amritsar happened almost four years ago. Why am I writing it today? 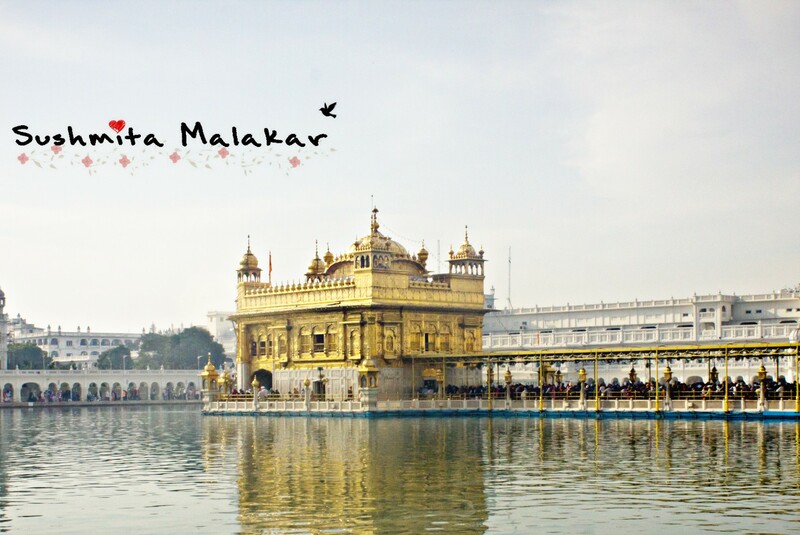 First, I really want to visit Amritsar again. But it is not happening anytime soon. So, I decided to revisit using the pictures from that visit and write a blog about it. Second, I had decided to complete writing about all the places I have visited so far by the end of this year. I don't want to be lazy any more! 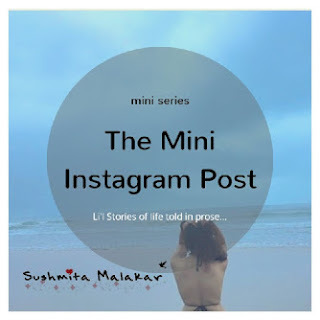 This blog might not have a lot of pictures because I have been a strict follower of rules. I don't take pictures where photography is prohibited. I traveled from Delhi to Amritsar via Ambala by road. When I traveled, the highway after the diversion which leads to Chandigarh and Amritsar was not that great. However, now the NH 44 has developed well and I heard that the drive is quiet great too. 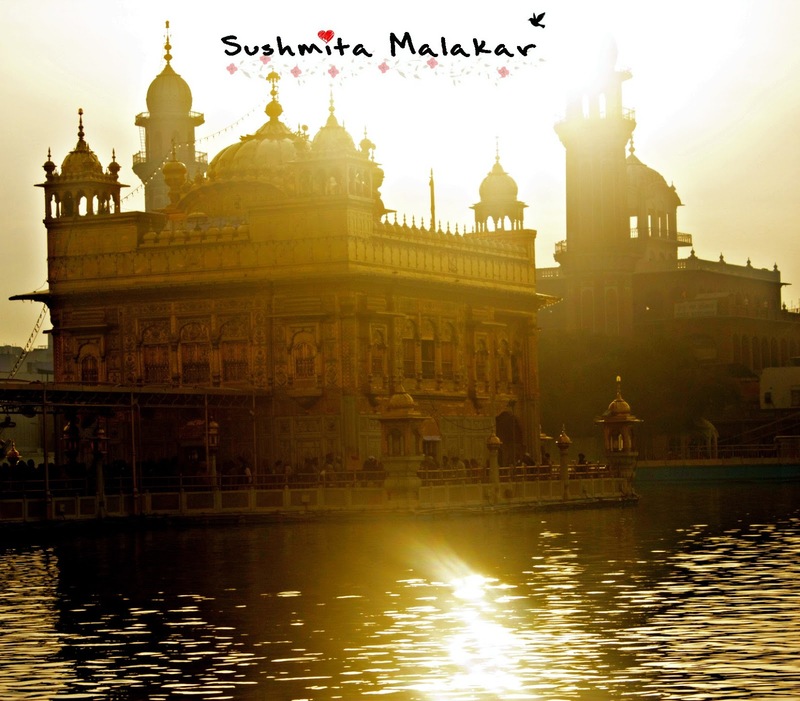 Best time to visit Amritsar is from November to March. If you love eating, then Punjab is the place to be. Make as many stops on the roads as you wish to. Delhi's go-to-long drive, Murthal, is there which is famous for the paranthas. Then there is Puran Dhaba which is famous for their chicken. 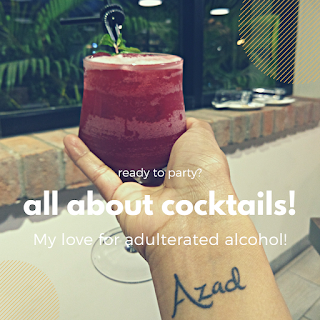 And Amritsar is a food lover's paradise with their scrumptious lassi and jalebi! People here are very helpful but this place is a li'l culturally conservative. It is always better to be a tourist and not interfere with the existing order. This was my family trip so we started off really early and that too on time. It was 5:30 in the morning. Though I was sleepy, I was super excited. After making our share of stoppages and detours, we reached Amritsar at around three in the afternoon. 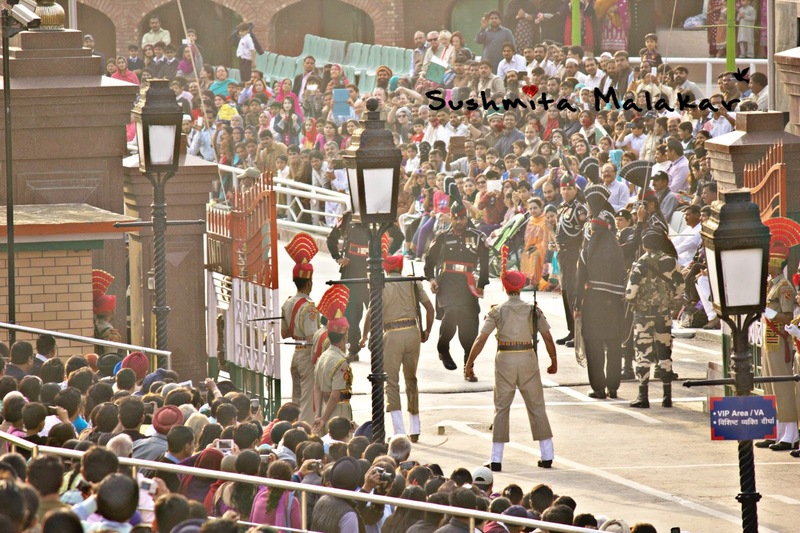 Of course, we would have loved to go to the Golden Temple the moment we reached Amritsar but since we were there for just one night, we decided to go to the Wagah border first. 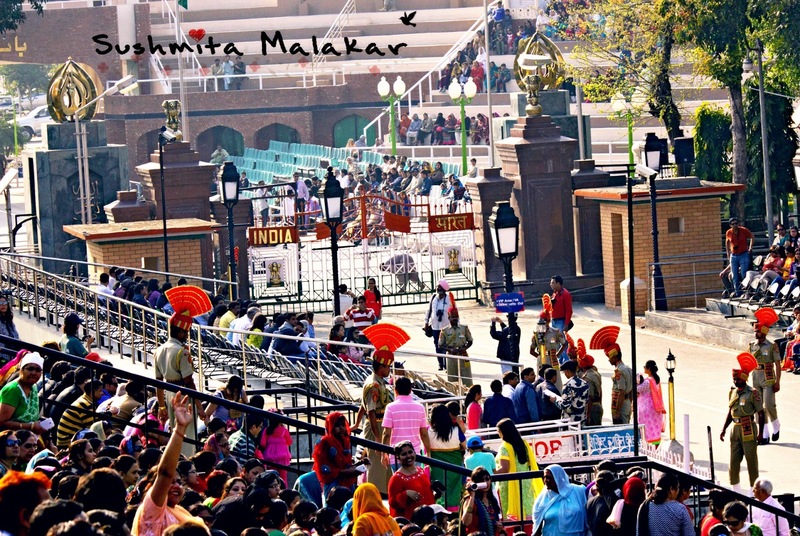 Wagah border is the border between Amritsar and Lahore. Pakistan is technically just 28 KM away from Amritsar! 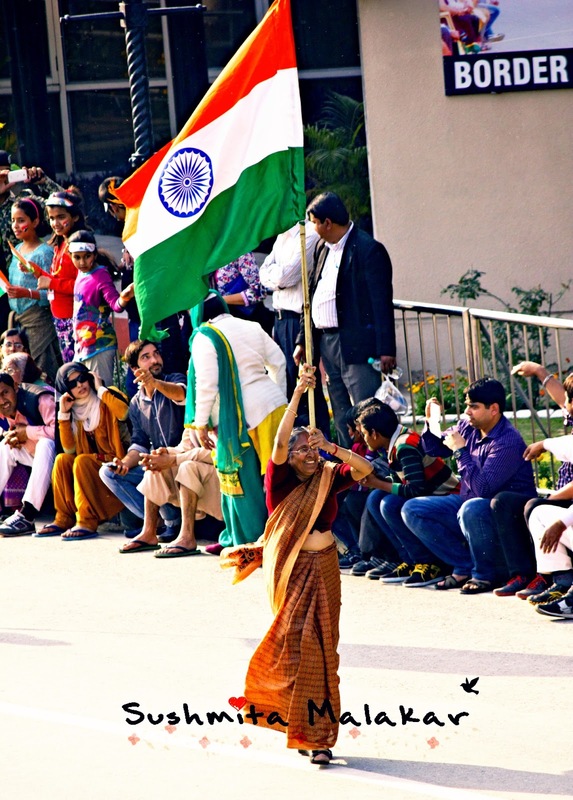 I had no clue that Wagah Border Ceremony was such a huge deal. 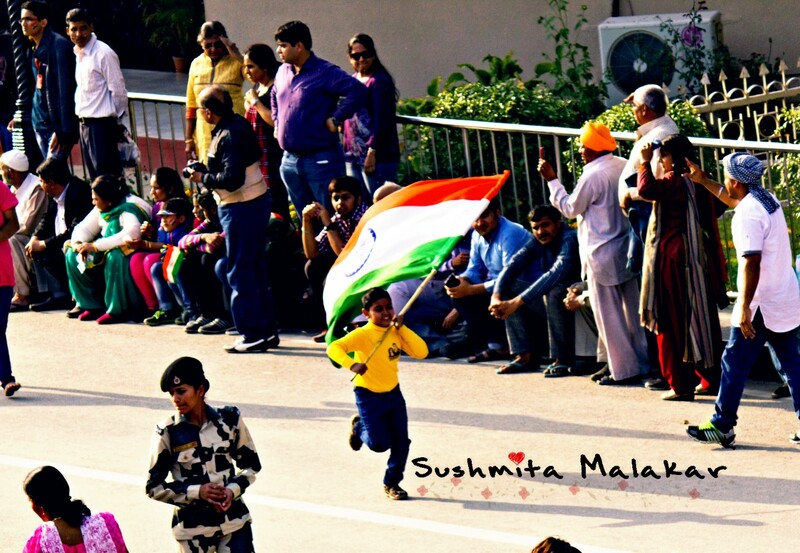 For the very first time in my life I had seen so much of patriotism flowing around. How much we love to show off! 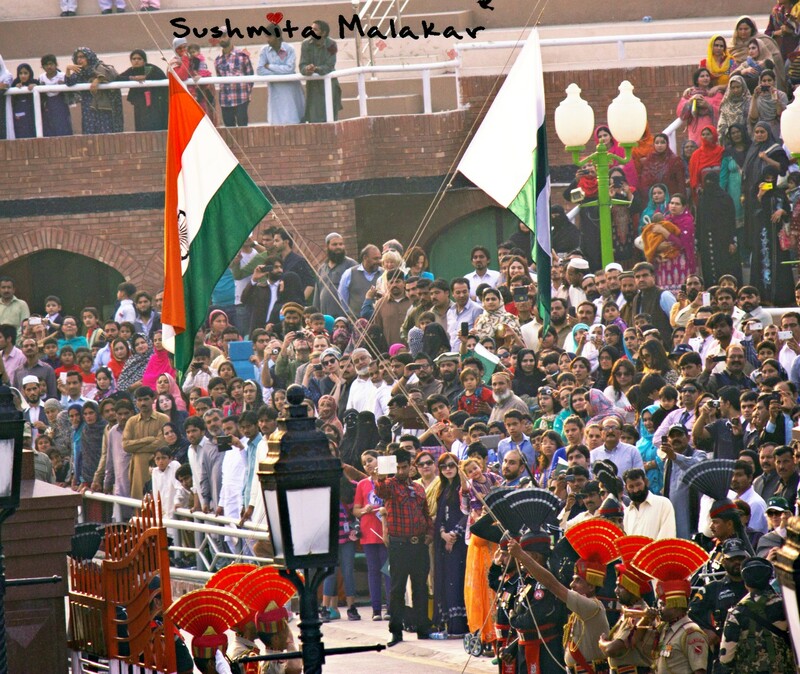 Wagah Border Ceremony, also known as the Beating Retreat Ceremony, is a military practice which begins with a parade by soldiers and ends with lowering with the flags of both the countries. The ceremony starts at 4.15 PM. The parade is amazing and the coordinated lowering of the flag is certainly mesmerizing. One very interesting thing - the sitting area on this side of the gate is jam packed, however on the other side there are probably just a handful of local tourists witnessing this ceremony. This side of the border is overflowing with patriotism and excitement. And the age is definitely not a bar! Please forgive me for the pictures. We were sitting on the top most row and the position was not such that we could click pictures clearly. The aggression and the discipline in the soldiers on both the side of the huge iron gates, which are closed during this ceremony, is commendable. But trust me, you can not sense any kind of hatred between the countries' soldiers. And that is how the ceremony concludes. I definitely had to get myself clicked. After this we went to the Golden Temple area. The hotels in this area are decent and clean. We took a family hotel in that area because we wanted to go to the Golden Temple early in the morning and see the sun rising there. What a breathtaking place this is! There is this serenity and peace that you get once you go to the Gurudwara. People here have immense faith and witnessing that is beautiful. The Harmandir Sahib, as this place is referred to, is part of a huge temple complex. The Hindu and Islamic blend of architecture is something for which you should definitely visit this place, if not for any religious reasons. The temple compound is edged with various other monuments one of which is the Sikh Museum which tells you about the history of Sikh warriors through the modern and medieval times. One interesting fact about this place is that the shrine or the tower where the Akal Takhat (that seat for the Guru Granth Sahib) is situated was destroyed during the Operation Blue Star. However, the people here refused to use a tainted building as such a holy place. And thus, the tower was build again, from scratch. Such is faith, my dearies! 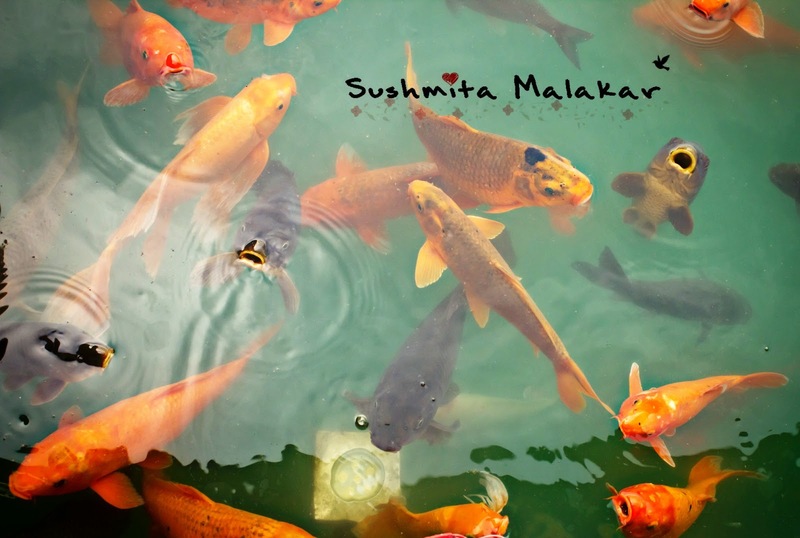 The Amrit Sarovar, which surrounds the golden shrine is said to be pious and have healing powers. I have heard many stories where people,from across the globe, have come to take a holy dip and get rid of ailments. By the way, this place takes it's name from this water tank. Photography is prohibited at most of the places here. Once you step inside the Harmandir Sahib, all you can hear is the Gurbani which is naturally soothing. Trust me, you will fall in love with this place. You might also catch some folk singers in the complex. After a long morning of exploring and admiring this place, we went to have some authentic breakfast of chhole - bhature. After that we ventured out to the Jallianwala Bagh. This place holds the memories of the saddest of the events in the history of India during the British rule. This place is a memorial and has preserved all the scary moments - the place from where the massacre started to the bullet marks on the wall. And don't be surprised if you feel that you are in the British times when people were oppressed and subjected to such cruelty. 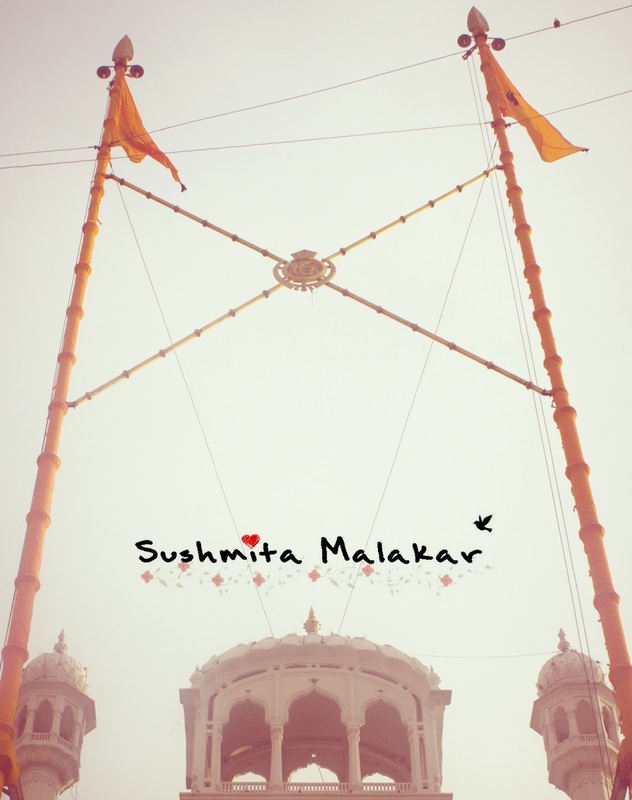 It is the aura of this place which will make you feel more rooted. No photos guys because photography is prohibited in this complex. And now that you are done with the major sightseeing and soul searching in the city of Amritsar, explore around the place. Shop for some amazing phulkari suits. Gorge onto some Amritsari naan and lassi. Breathe in the pious air. Let the history sink in. 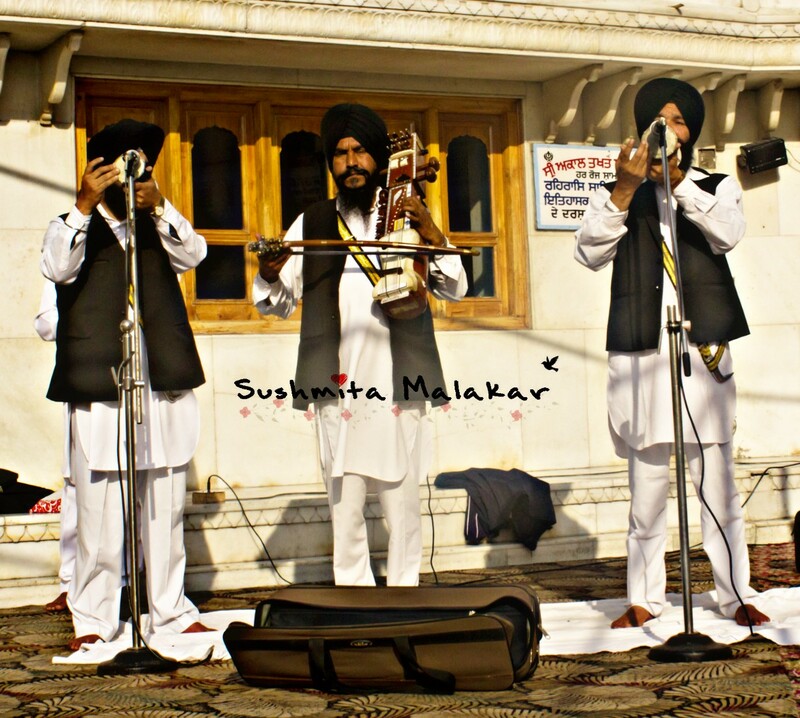 I want to go to Amritsar again. And I hope that it happens soon! I plan to travel to Amritsar from Delhi by road. I will be travelling by Grand i10 with my wife, 11 months kid and mother. Can you please suggest if the roads are good and comfortable ? How much time will it take for the journey ? I plan to leave at 7 am in the morning. Please share your experience. Thank you for dropping by. See, I will be honest. Some stretches are pretty bad when visiting Amritsar from Delhi. Plus i10 might not be the best car to travel with such a li'l baby and an elderly. After making proper stoppages, the journey is of almost 8hrs. Had you been alone or just with your wife, I would have still suggested you to take this road trip. If you are very keen on the road trip, you can either hire a cab or a self driven car - like an SUV or some car which is more comfortable. Else, take flight. Amritsar is nice place to visit with family, but make sure your travel is comfortable. 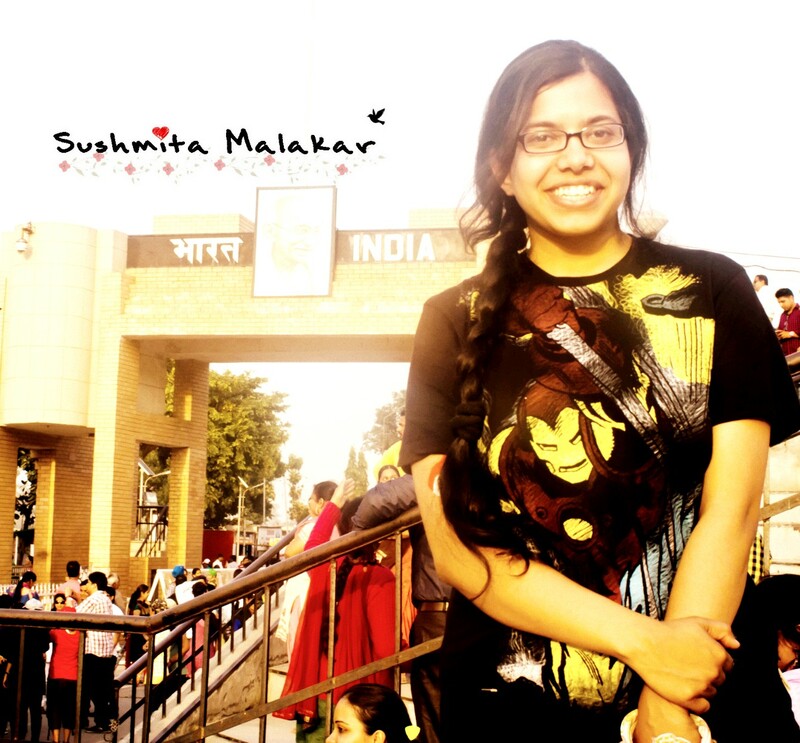 Lovely post Sushmita, I have been to Amritsar couple of times and his post brings back all those memories. Beautiful and serene farms, spiritual Darbar Sahab, colorful markets, hearty food and border visit full of action and energy. Loved it.